Ahi Poke Bowl — Oh Wonderful! Remember when I mentioned that I wanted to go on a warm, island vacation? If you’re wondering, I still haven’t gone on that dreamy vacation, but that dream is still very much alive. So much so, that I funneled my pipe dreams into making the perfect poke bowl to remind me of my island vacations in years past. This ahi poke bowl recipe was created in tandem with my mother over Facetime, so it’s a little bit of the both of us in one dish. The key to delicious poke is fresh, sashimi grade fish. This means heading to a local fish market or asking the fish counter at your homebase grocery store for the freshest catch of the day. Salmon would hold up to this recipe just fine! Another rule of thumb: Always go for wild, locally caught fish, never farm raised. 1. Slice your tuna into small, quarter inch cubes and set aside. Begin to cook your rice, either with a rice cooker or a pot of boiling water. If you’re using the pot method, bring one cup of rice with 1 1/2 cup of water to a boil. Once it reaches a boil, simmer for 20 minutes until fully cooked and fluffy. 2. In a separate bowl, stir the soy sauce, sesame oil, garlic, shallots, ginger, Sambal Oelek and 3/4 of the sesame seeds together. Gradually mix in the cubed tuna. Allow the fish to marinate in the fridge for at least 20-30 minutes. 3. Once your rice has cooked, mix in the rice wine vinegar and the remaining portion of black sesame seeds together. 4. 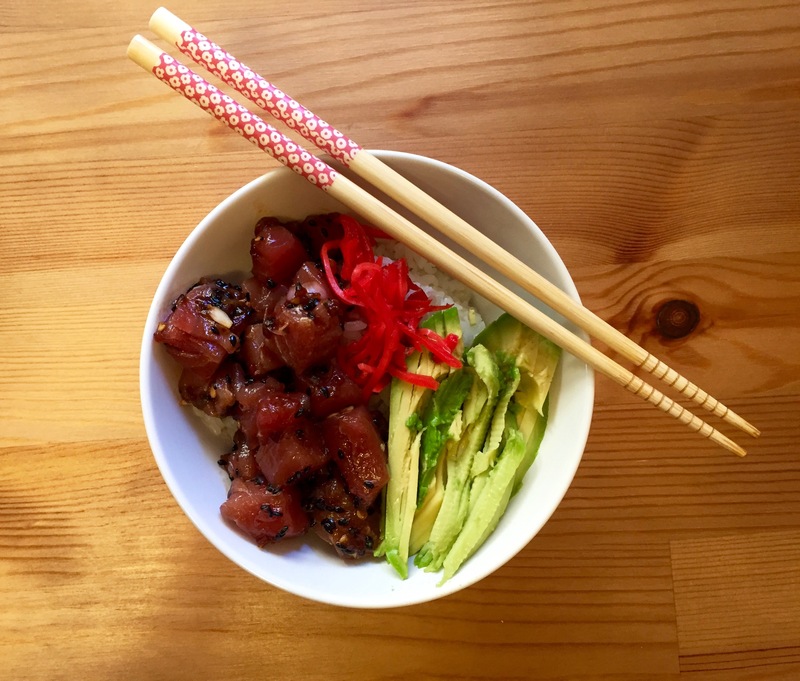 To assemble your poke bowl, layer the ahi over your sushi rice, then top with the green onion, fresh avodado, pickled ginger, cucumbers or whatever else you’re craving. Enjoy!